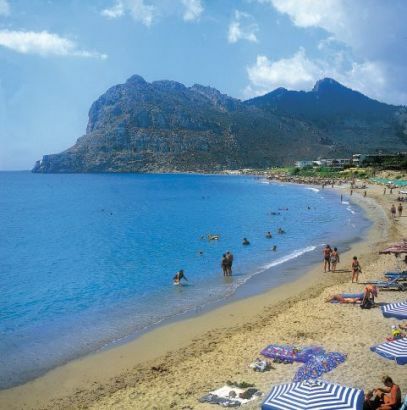 Kolymbia (Kolympia) is a beach resort located in the midle of the distance between Rhodes and Lindos, at a central location to explore Rhodes. Those that visited Kolymbia will remember the Eucalyptus road leading to the beach from the main road with the big trees on both sides. At the south edge of the beach there is a fish tavern and afterwards a small fishing bay and port (Limanaki in Greek) with a chapel. Kolymbia is ideal for families and those wanting to relax and enjoy the sea. It is a low profile seaside resort, with neither the luxury of Ixia nor the intensity of Faliraki, and thanks to the nearby Seven Springs (Epta Piges) it is very green.